The first evening we were in Prague, we made a night of it, and set off to the Opera! We had both brought some fancy clothes to wear for this type of occasion and so we got dressed in our best and set off for a night on the town. The interior is what makes this building known worldwide as one of the most beautiful buildings in Europe. 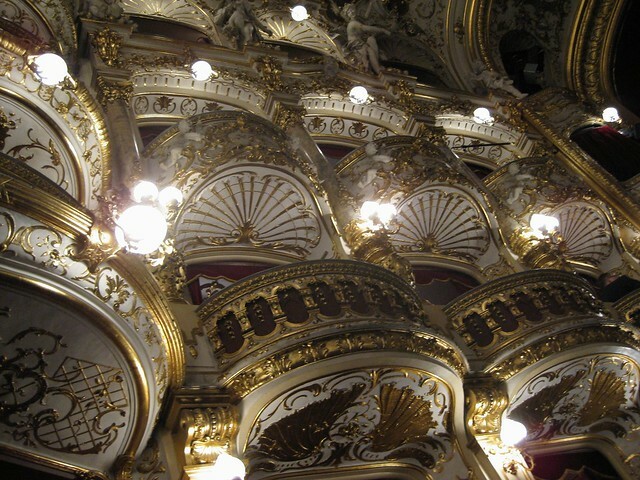 In 1886 architect Alfons Wertmüller was inspired by the opera houses in Vienna, to create a fury of gold and stucco for his new Opera house in Prague. The style of the interior features neo-Rococo decorations. It features traditional baroque designs with lots of stockwork and gold leafing. Asymmetrical designs which grow like flowers across the ceiling and along the balconies. They are so graceful and almost weave your mind into a lullaby while looking at them. Inside the larger designs on the roof were dark frescos of famous scenes from the may operas once put on inside these doors. When the Opera opened, Wagner's opera "Die Meistersinger von Nürnberg" was their first performance. The night we were visiting, we were off to see "Carmen" an opera by French composer Georges Bizet. Although written by a Frenchman, it is set in southern Spain and follows the life of Don José, a naive soldier who is seduced by a sultry gipsy named Carmen. The production was both beautifully designed, well sung and touched on the comedic aspects with dexterous aplomb. We had bought box seats since they weren't much more expensive than the regular seats and we knew we wouldn't have many chances in our life to experience this luxury! And luxurious it was. The seats weren't the most comfortable be the box itself as like something out of Phantom of the Opera and the ornate decoration in the booth ade you feel like someone special. During intermission we got to admire the detailing around the Opera house. 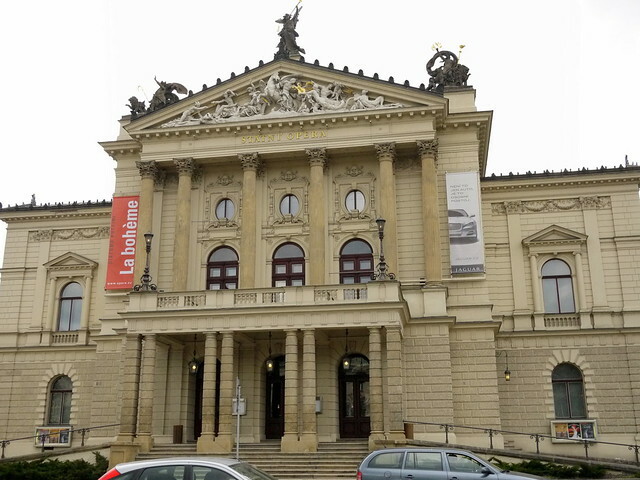 Outside of the main theatre, the was only white and gold colouring and one can only imagine what things would have looked like, when the elite of Prague came to the Opera in their colourful finery. We got a few snacks during intermission to enjoy throughout the rest of the show. I was amazed by how compelling the production was and even Dan seemed to very much enjoy the entire show. After it all was over, we were exhausted from a long day or travel, sightseeing and smiling.